The government in India's western state of Rajasthan says it is to introduce a law banning religious conversion. It follows tension between Hindus and a Christian mission holding its annual convention in Kota, 250km (155 miles) from the state capital, Jaipur. The state home minister warned foreign delegates their tourist visas did not allow them to attend such a function. The mission's chief, MA Thomas, said Hindu activists had humiliated and beaten up some of the delegates. Hindu activists from groups such as the Bajrang Dal and the World Hindu Council, or Vishwa Hindu Parishad (VHP), say the Kota convention, which began on Wednesday, is being used for conversion to Christianity. The activists have set up checkpoints on roads leading to the mission, stopping delegates who are coming from all over India and abroad. The state government, run by the Hindu nationalist Bharatiya Janata Party, said there were more than 60 foreigners at the Kota mission, mainly from the US, who had come on tourist visas and had no right to participate in such functions. On Wednesday, police used force to disperse Hindu activists who were trying to enter the mission premises. Six people, including three policemen, were injured in the incident. State home minister, Gulab Chand Kataria, said the Christian mission had not divulged its programme to the administration. "We will not allow anyone to convert poor and illiterate people," he said. 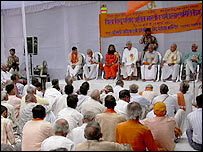 The Vishwa Hindu Parishad welcomed the state government's move. The state has a very small Christian population of 0.11%. State governments in India do have the power to introduce anti-conversion laws. The southern state of Tamil Nadu had similar legislation but it was scrapped amid political controversy and opposition from religious minorities.